KwikSweep offers hazardous waste collection and disposal service from your home and business premises. Below is a list of hazardous waste we collect and dispose. None of the hazardous waste we collect goes to landfill and the majority recycled. If your company produces less than 500kg of hazardous waste in a year, you do not have to register with the Environment Agency, but you do need to dispose of your waste the right and safe way. What we collect and why is it hazardous? 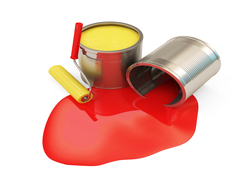 Paint contains chemicals, such as solvents and metals that can contaminate groundwater if sent to landfill. Asbestos are naturally occurring minerals which are present in the environment. Breathing in high quantity of asbestos fibres can increase your chances of getting an asbestos related disease. We ensure that we work in line with The Control of Asbestos Regulations 2006 when dealing with the transportation of asbestos. Fluorescent tubes/lamps contain small amount of mercury (Hg), which in high levels can be very dangerous to your health. 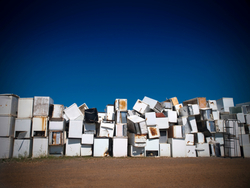 Fridge's contain CFC gas, which is dangerous to humans when inhaled and also destroys the ozone layer. TV/Monitors contain CRT (Cathode Ray Tube) may contain toxic phosphors within the glass envelope. The glass envelopes of modern CRTs may be made from heavily leaded glass, which represent an environmental hazard. Batteries can be hazardous if put into ground as lead could leak into water which is bad for your health. Please call our friendly team for a quote and further information. For further information about our hazardous waste collection service in London, call us on 0207 624 9215 or email us now.